Take your grooming essentials to go with the Ashanti Design Toiletry Bag. Made from recyclable cotton off-cuts, this bright bag redefines rugged accessories. Each bag has a unique, vibrant pattern — no two bags are quite alike. This Ashanti Design Toiletry Bag provides a handsome home for your bathroom essentials, whether you're grooming at home or on the go. The bag features a brass zipper and d-ring for easy hanging. Add contemporary African design to your everyday life with the Ashanti Design Toiletry Bag. Ashanti bags are always one-of-a-kind since the upcycled fabric is consistently different, and the colours are chosen by the artists in the moment. Ashanti Design bags are designed and handcrafted in South Africa, supporting rural villages in Africa and bringing the south african culture to modern homes. We want to make sure that production leaves little-to-no carbon footprint; any purchase of any product from Africa Frolic is made 100% guilt-free, including the Ashanti Design Toiletry bag. Ashanti Design is proud to be part of the new upcycling movement; their products are motivated by a wish to reduce the amount of material that typically goes to landfills. These cotton cutoffs are woven into high-end textiles and then used to create our fabrics. In addition to their upcycled bags, Ashanti Design has a fabulous selection of organic bean bags, pillows, benches, doorstops, and other home accessories found on Africa Frolic. All their products are 100% unique and eco-friendly. Ashanti represents the best of contemporary African design. 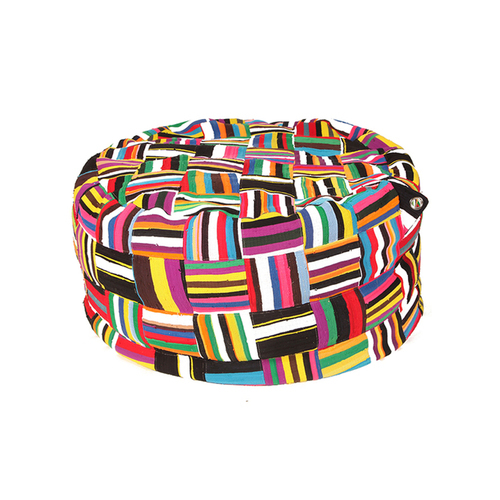 Add some South African style to your home with any product from the Ashanti Design. Discover more of their collection in the categories featured on Africa Frolic below.